Observers like Bobbin manned lookout towers around England and served aboard most English fighting ships. They identified German aircraft in the skies over England from friendly fighters and bombers when they sailed into battle. “During World War II many of our own aircraft were shot down by friendly fire from English anti-aircraft guns because these planes were improperly identified,” the 85-year-old local man explained. “To correct this problem the Royal Observer Corps was formed. 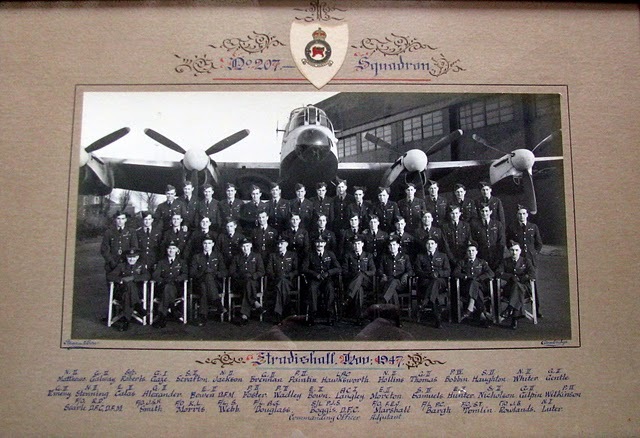 At 17, in 1943, Bobbin signed up for the Royal Air Force. He was selected for multi-engine training and wanted to become a bomber pilot. This is Bobbin’s bomber training squadron in England. The backdrop is a British Lancaster heavy bomber like the one he piloted in the RAF for three years. Photo provided. 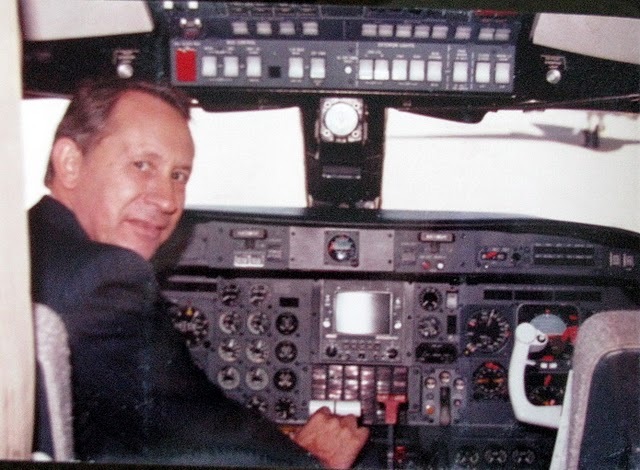 “By the time I signed up for pilot training they had all the pilots they wanted for the time being so I was sent home. It was during this period I was assigned to go aboard a U.S. liberty ship as a member of the Observer Corps during the D-Day Invasion in June 1944. In order to be in the war zone they made me a temporary petty officer in the Royal Navy for 30 days,” he said. “I worked with a U.S. Navy lieutenant who was in charge of the anti-aircraft guns aboard the liberty ship I was on. It was my job to give them the order to fire or hold their fire. We never saw any German planes so I never gave the order,” Bobbin said. 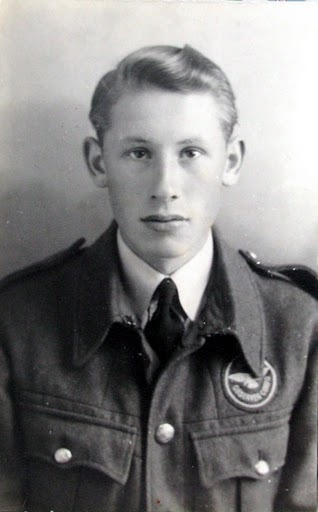 After the Normandy invasion, he returned to London to begin basic RAF flight training. As part of President Roosevelt’s Lend Lease Program, Bobbin and his fellow cadets went to to flight school in the United States. “They sent us to Miami, Oklahoma where we flew a Stearman PT-19, an open cockpit, two seat biplane. 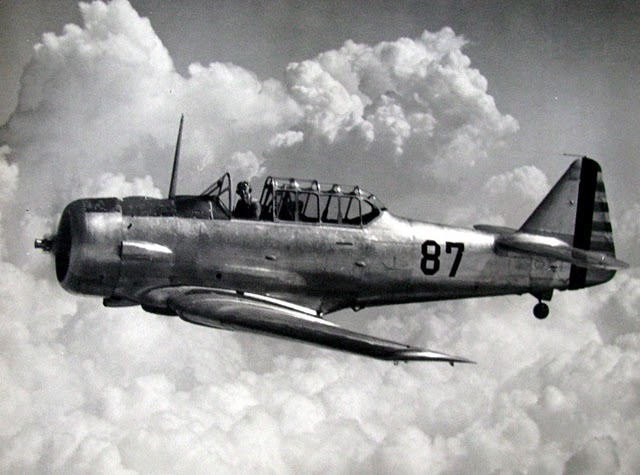 Then we graduated to AT-6s, a much larger and more powerful plane. 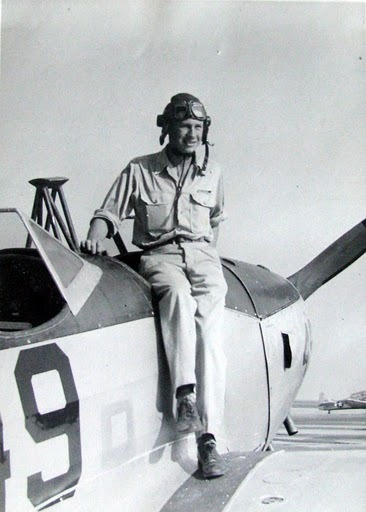 Shortly after he got out of the service as a flying officer, he decided there were more aviation opportunities in the U.S. than in England, so Bobbin came to this country. The Korean War was raging and he was eligible for the draft. Instead of being drafted, he joined the U.S. Air Force as an enlisted man. 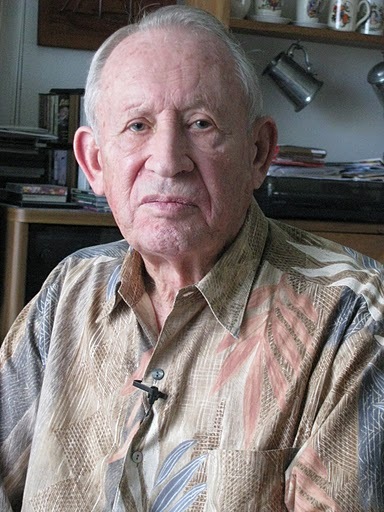 He became a crew chief on a B-25 Mitchell two-engine bomber similar to the one Col. Jimmy Doolittle flew off the deck of the carrier Hornet in April 1942 on his heralded mission to Japan with 15 other B-25 bomb crews. It was at Carswell Air Force Base in Fort Worth, Texas Bobbin was assigned to work on B-36 “Peacemaker” bombers. They were the largest bombers ever built by the U.S. shortly after World War II. They had six propeller driven engines and two jets on the wing tips that powered the v-winged Goliath’s. The B-36 bombers were so large they had a tram running through the center of the plane that carried crew members from the front to the rear of the mammoth bomber. It was designed to fly non-stop from the U.S. to Europe, drop its bomb load and returned to base in the U.S. without refueling. “I took part in a top secret flight of a B-36 in January 1950 that carried the first American atomic bomb out of the country. It was a Strategic Air Command assignment. The 7th Bomb Wing under the control of the 8th Air Force flew from Carswell Air Force Base in Fort Worth, Texas to Maine and from there to the RAF base at Lakenheath, England,” Bobbin said. The purpose of the mission was to evaluate the strategic capabilities of the B-36 bomber. After four years in the U.S. Air Force, he went looking for a civilian job in aviation. Like thousands of bomber pilots before him, Bobbin wanted to fly for the airlines. He quickly learned at 27 he was too old to go to work for Eastern or Pan Am. Their cutoff date was 26. Just by chance, a friend who was the senior pilot for Seagram’s Distilleries in New York was looking for a qualified pilot to fly the company’s brass in the corporate jet. Bobbin got the job. In no time he switched from propeller driven Air Force bombers to Gulf Stream II corporate jets that could fly non-stop from New York to Paris at 500 mph at an altitude of 45,000 feet. “I spent the next 30 years flying corporate jets around the world for several companies. My wife, Ann, and I retired to Punta Gorda Isles 23 years ago. We have three children: Theresa, David and Tom,” Bobbin said. This story was first printed in the Charlotte Sun newspaper, Port Charlotte, Florida on Monday, Nov. 3, 2010 and is republished with permission. Click here to view Bobbin’s Collection in the Library of Congress’ Veterans History Project.